Do you know any Irish people living in Munich? I am working with the Irish Folk Club Munich and Deutsch-Irischer Freundeskreis to bring a couple of live radio shows from the Bavarian Capital. I am looking for Irish people in Munich to take this survey. Please pass on a link if you know someone living there. 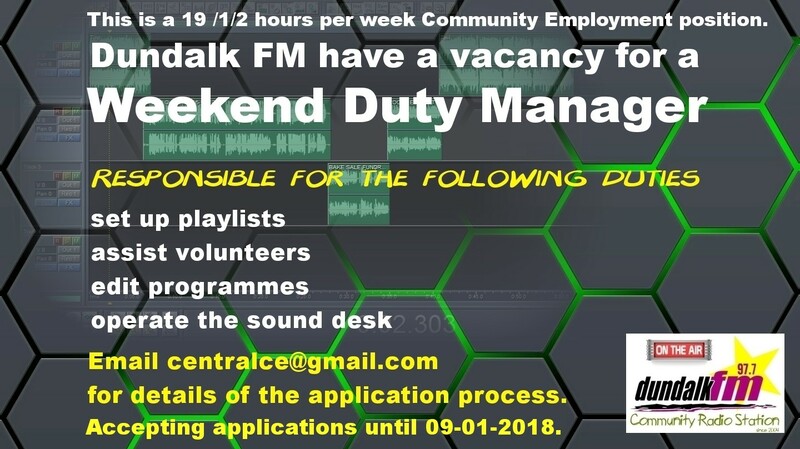 Dundalk FM is now recruiting for a Weekend Duty Manager. Duties include operating the sound desk, audio editing and archiving programmes. The job is for 19½ hours per week and candidates must qualify for Community Employment. Please check with your local employment service office for eligibility. The closing date is Tuesday 9th January 2018.